New Year Super Sale! Get 50% off Your Order + Extra $50 Off Orders of $500 or More + Free Shipping on Your order. Limit One per Household. 2 Day Flash Sale! Get 50% off Everything + $100 off $1000. Limit one per household. Get 40% – 80% Off Select Rugs. Launch Special! Get 50% Off Premier 2 Cellular Shades. Get 55% off Featured Honeycomb Shades. No minimums. Free Shipping everywhere in Canada on Blinds under 94 wide. Winter Weekend Sale! Get 45% Off Everything + 10% Off Orders over $250 + Extra $100 Off Orders over $1000 + Free Shipping. Extra 10% Off only applies to the window coverings with an initial discount of 45%. Limit One Per Household. 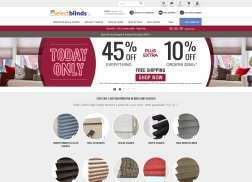 Get 50% Off all window blinds on orders over $250 or 45% Off orders over $100 otherwise 40% off. Get free shipping on Select Rugs offers anywhere in Canada. Get 60% off Outdoor Shades. No minimums. New Year, New Deals! Get 50% off orders $250 or 40% off otherwise + Extra $50 off orders over $500 with code + Free Shipping on all orders. Limit one per household. Get free shipping on Select Rugs anywhere in the continental United States. Get 50% off Featured sheer shades.